With eight album releases to date and $2.5 million in retail sales, the Country Faith music series continues their trail of long-term success as the compilation continues to expand its brand and grow in popularity. Distributed through Curb/Word Entertainment, both albums will be available through digital retailers, including Apple Music and Amazon. Country Faith Southern Gospel CD’s will also be available in retail stores across the country. Country Faith Christmas Vol. 2 will be sold exclusively in Cracker Barrel stores and is one of only four featured Christmas releases at Cracker Barrel’s over 600 stores, which are located across the U.S. The new holiday release follows the original Country Faith Christmas album, which was released in October 2013. Following its release, the album became the No. 1 CD Pick in People Country and was featured in Parade magazine as well as many other national publications, including Billboard, Country Weekly and more. Additionally, Country Faith Christmas debuted in the Top 10 on Apple Music’s Top Country Album Chart. 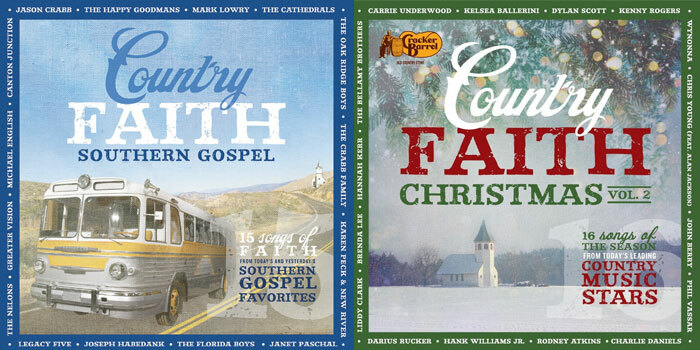 The Country Faith series was originally inspired by the popular books, Country Faith and Country Faith Christmas, written by Nashville-based journalist, Deborah Evans Price. Price is a Country Music Association (CMA) award-winning author, as well as a freelance writer for Billboard, Sounds Like Nashville, First for Women, Redbook and Woman’s World. Price is the co-founder of Country Faith, LLC where, “Celebrating the Heart and Soul of Country Music,” is her ultimate goal. She has partnered with Wildfire7 and Bob DeMoss to produce the Country Faith brand and its product line. There are now eight full-length albums, two books and ten jewelry pieces in the brand. Time Life Music is featuring the Country Faith book on national television as a bonus product in its Faith, Hope and Country collection and Country Faith has also been featured at CMA Fest with awareness and sales to over 80,000 Country Music fans each year. Current brand partners include Curb/Word Entertainment (CD/Digital), Time Life Music (TV Direct response), Regnery Faith Publications (Books), Cracker Barrel (Retail), Bob Siemon Designs (jewelry) and New Day Distribution (indie distribution). 5. Little Drummer Boy – Hank Williams Jr.